WASHINGTON — Facing a critical Senate vote on his tax overhaul and a crush of December deadlines, President Donald Trump is instead putting the spotlight on a volatile collection of extraneous topics — anti-Muslim videos, Pocahontas, NFL players who kneel during the national anthem and his multiplying disputes with the news media. He also tweeted about his call with Chinese President Xi Jinping and plans for additional sanctions on North Korea. But the president’s extraneous tweets and quips have diverted attention from Trump’s agenda at a time of maximum consequence for his tax proposal and with a series of looming budget deadlines and other priorities in Congress. Wednesday’s tweets came hours before Trump was departing for Missouri to rally support for his tax plan in the Senate. While it was far from the first time that Trump’s tweets and broadsides have been used to deflect attention, they nonetheless offered fresh evidence of the president’s tendency to latch on to particular cultural touchstones and refuse to let them go. Trump’s broadsides may seem random but they serve the president well on another front, by energizing his core supporters with darts that are sure to delight. The president has been mocking Democratic Sen. Elizabeth Warren as “Pocahontas” since last year’s presidential campaign and he reignited the feud with a passing comment during a White House ceremony on Monday honoring Native Americans. He’s been fanning the NFL-anthem issue throughout the fall football season. And he continues to bash political opponents like Democratic congressional leaders Chuck Schumer and Nancy Pelosi as tax-hiking pushovers who are unwilling to bolster law enforcement, the military or the nation’s borders. Hours before a scheduled White House meeting Tuesday with the two Democrats and Republican congressional leaders, Trump slammed Schumer and Pelosi on immigration, crime and taxes, adding, “I don’t see a deal!” The two Democrats abruptly pulled out of the meeting, prompting Trump to leave empty seats for them on either side of him in the Roosevelt Room alongside Senate GOP leader Mitch McConnell and House Speaker Paul Ryan. Even as the White House is searching for the votes to push a major tax package through the Senate, the president and his allies are itching for a fight with Warren, a potential 2020 Democratic presidential candidate and vocal Trump critic. Trump has long mocked Warren’s claims about being part Native American, which first surfaced during her 2012 Senate race against Republican Sen. Scott Brown in Massachusetts. 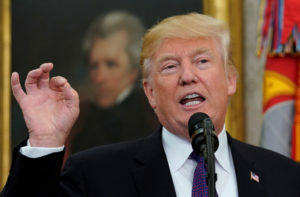 Even in a country that has grown more diverse with each passing decade, the president has brushed aside criticism that the term is a racial slur. “He’s wrong. It’s not going to make any difference,” Warren said. But Trump’s allies welcome the comparisons to Warren, a liberal icon in a party grappling with a leadership vacuum and still searching for the best way to counter the president. “It’s about her not telling the truth and the extent to which she wants to engage in a debate on this, please keep going,” said former Trump campaign aide Barry Bennett. “The more the conversation is him vs. her or the progressive Bernie Sanders wing of the party, it makes him look even better, because frankly there are a lot of Americans in between the coasts who are scared to death of progressive values,” Bennett said. His tweet about them on Tuesday helped allay concerns among some Republicans that he might use the meeting to negotiate with Democrats — without significant GOP input — on a budget deal or to protect immigrants who were brought to the U.S. illegally as children and whose protected status is set to lapse next year. Trump’s allies dismiss the notion that the president’s focus on side issues is an unwelcome distraction during a week in which the administration hopes to clear a big hurdle on taxes and give the president a major legislative achievement before the 2018 midterm elections after frustrating setbacks on health care. The president was making the case for the tax cuts during a speech Wednesday in St. Charles, Missouri.